Tricia Nguyen wears a sterling silver charm bracelet adorned with tiny portraits of her son at each stage of his four years of life. In conversation, she will twirl the bracelet on her wrist and twist the individual pictures of Timothy, who lost a nine-month battle to brain cancer in October 2010. Tricia's firstborn son, Justin, 8, calls this treasured bracelet his younger brother's "life cycle" – a life filled with love, Super Mario Brothers and the aspirations of a preschooler who was just learning things fresh for the first time. John Nguyen, Timothy's father, recalled the earliest symptoms when his son returned for his second year of preschool at the Eastlake Children's Center in the fall of 2009. Timothy was wearing new back-to-school skater shoes, and a teacher recommended perhaps buying sturdier gym shoes because he was stumbling throughout the day. Other symptoms followed, and an MRI (magnetic resonance imaging) exam ordered by Timothy's pediatrician confirmed the dire diagnosis on January 12, 2010. One month later, Timothy had to withdraw from his neighborhood preschool. When Timothy first met his neuro-oncologist, John R. Crawford, M.D., M.S., director of the Neuro-Oncology Program at the Peckham Center for Cancer and Blood Disorders at Rady Children's Hospital-San Diego and assistant professor of neurosciences and pediatrics, the University of California, San Diego School of Medicine, he had ataxia (lack of muscle coordination during voluntary movements), facial asymmetry (an unbalanced face) and abnormal eye movements. Due to the location of the tumor, Timothy's ability to chew and swallow would later be affected. Early symptoms like Timothy's are often confused with those of Bell's palsy or a post-inflammatory process of the facial nerve that is benign, Dr. Crawford explained. And parents might think that the abnormal eye movements, in which one or both eyes may be crossed, is voluntary "kidding around" by their child. Timothy's tumor was a diffuse intrinsic pontine glioma (DIPG), the most malignant of the brainstem tumors. Approximately 90 percent of children with DIPG die within two years of diagnosis despite treatment. "Childhood brain tumors are the second most common primary tumor of childhood and account for the No. 1 cause of death due to cancer in childhood," Dr. Crawford said. When John and Tricia received the news about Timothy, they had many conversations with Dr. Crawford about the lack of information on DIPG and how to treat this aggressive disease. On Dr. Crawford's recommendation, the family chose a combination of radiation and oral chemotherapy. Timothy's health declined, and on family trips, he would be pushed in an umbrella stroller. When his left hand stopped working while playing the Wii, he would switch the controller to the other hand. When both hands stopped working, he would sit on the couch and watch his brother Justin play the games. "He was such a good patient," Tricia said. "He never complained." Nearly six months before Timothy's death, the couple knew they had to make a difference and change other children's lives in honor of their dying son. In May 2010, John and Tricia launched a Miracle Makers fundraising campaign to raise $70,000 for naming a patient room in honor of Timothy and to support cancer research by Dr. Crawford. Through this fundraising, the family started their journey toward healing. 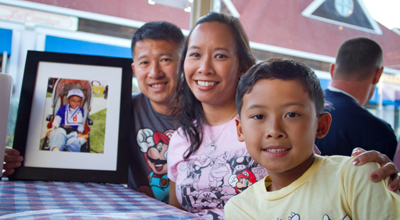 For more information about the Nguyen family's fundraising campaign, visit www.friendsoftimothynguyen.com. For more information about the Neuro-Oncology Program at Rady Children's Peckham Center for Cancer and Blood Disorders, visit www.rchsd.org. To support Rady Children's Neuro-Oncology Program, click here.